Adopting these two has been remarkably like bringing home a child. Expect them to sleep, wake, pee, poop, eat, sleep…repeat! Throw in some play time and it pretty much sums up the days for now. Although it is fun, watching the foals right now is also critical. The team at Last Chance was very clear that you often see changes in their behavior, or a lack of perkiness, as the first symptom of a problem (so I have an official reason to be watching them at all times, lol). During all of that watching it is important to watch for things going in…and things coming out. Watching for urination is a great way to make sure they are hydrated. This also helps me know who might be taking in more or less milk. Just because the bucket is lower doesn’t mean they are both drinking, although these two are making things easy because they both drink when I’m around. Having them trained to drink from the bucket is sooooo nice! My job is to keep the food fresh and available, their job is to drink and eat. I also watch for who is trying out more solid foods like the milk pellets, hay or hand picked grass. The next sign I will watch for is for the foal manure to change to the standard adult horse shape. 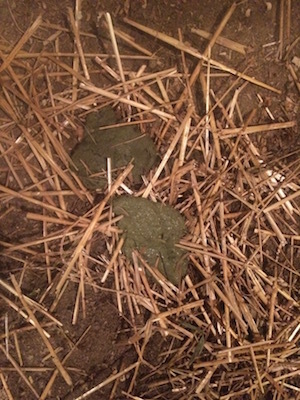 While we were at Last Chance Victoria was cleaning up manure and announced, “Horse poo!” because one of the foals had made the change to grown up poo shapes, lol. The place where we are living has an awesome set up for housing the foals. The stalls open into runs and I can choose to keep them in over night and then swing the gate open during the day. They have already decided that sacking out in the sun is the place to be! Later in the afternoon they wisely choose to move back into the shady stall. They have officially met the neighboring horses who were fascinated by the foals. The foals were more interested in playing with each other and tasting everything in sight. Thank you to everyone who left a comment and questions. I will work the answers to those into the upcoming blogs…right now I’m gonna go scratch a foal! ← Day 2: How did we pick the foals? What are their names? I am SO enjoying following your journey with these two babies!! thanks for sharing. I’ve never started a horse this young so it’s fascinating to me. HI Stacy, I am looking forward to all of your posts! How old are they now? I am so hoping that you are able to keep both of them, it will be a hard decision to let them go after you have become their MOMMA. Do you have names for them yet?? Stacy I can tell you’re having a blast ! I’m so glad you took on this project. Raising orphan foals has resulted in so many problem horses before, having YOUR take on how to properly do it will be priceless. They look very content in their new home. Looking forward to accompany them on their journey :-D. I really admire that you go all in and everyone can feel that this is what you love! How much milk are they drinking? How often do you have to feed them fresh milk? Are you feeding around the clock still? They are very cute. Nice choice. I love reading and following this. I’d like to adopt some day, once I’m able to get acceptable fences and a barn. I want lots of pictures and see their progress. Thank you so much for this blog Stacy. I look forward to reading it every day. Reading this is highlight of my day! Thanks for all you are doing for them, they obviously got so lucky when you chose them. ? I think it is great that you are able to do this for these beautiful animals!! I love being able to follow along with what is happening and even loved the photo of the foal poo! Thanks for sharing your journey with us! Love following your posts. These are two very lucky foals. I smiled when I read you’re not eating chocolate cake for a while. After getting a couple of pet goats I can no longer eat chocolate covered coffee beans! This is so exciting, being able to read along with you! You must be thrilled! The babies are beautiful, and I’m sure they will get the best care possible!! You’re amazing! How awesome. I am loving reading your experience. 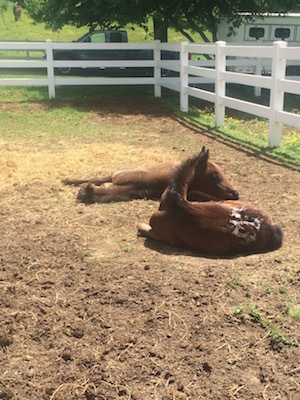 Looking forward to see how you train these littles….I am a first timer with a little colt. Have been reading everything I can on how to handle these little guys. Good luck Stacy…they are lucky to have you as their “mom”!!! I live about half an hr from you and would love to come meet them one day if you have the time. They are both really nice babies. They are both so cute!Thank you for sharing! This is all so informative. It does sound like any baby that is being cared for. You write with humor and for those of who love all things horsey nothing bothers us…the “frosting” thing was a little hard to “swallow”…..Glad I am not a chocolate freak. So glad you have two as they seem to do much better in pairs. How do you help them get over the “must be together” issue when you work with just one? How wonderful!! As soon as I can I would love to follow in your footsteps and adopt two foals!! I love to see them and have you tell us everything that is going on. They are just to precious, bless you and your family and taking them on.